Tablet is the most common solid dosage forms prescribed and accepted worldwide. Although there are various types of tablets available in the market depending upon the size, use and formulation but the basic excipients used in the formulation of tablet are same everywhere. 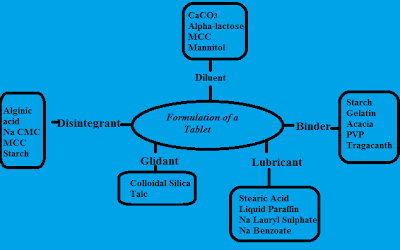 In simple language, tablet is a solid dosage from comprised of active pharmaceutical ingredient along with several excipients for attaining the desirable biological and pharmaceutical properties. From an estimate, two-third of the prescribed medicines in the world is tablet. Most of the tablets are given through oral route but depending on the need and patient’s concition it can also be given rectally, vaginally, buccally and sub-lingually. Size and shape of the tablet also vary according to the formulation and need of the patient. Some tablets are just of few millimeters while other go up to 1 centimeter. 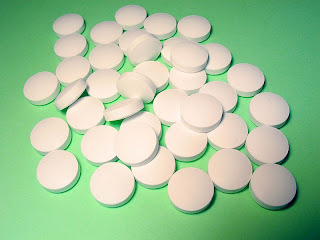 Also, shape of the tablet can also be either oval, round, capsule shaped etc. Beside from the active ingredient, tablet contains various other ingredients like diluents, binder, disintegrant, glidant and lubricant. Chief role of the excilients in the tablet formulation is to impart desirable pharmaceutical and biological properties to the tablet. 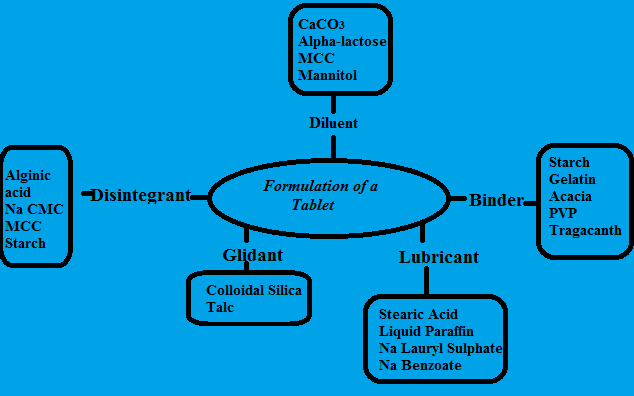 Here is the detail of the different excipients used in the formulation of the tablet. a) Acacia mucilage (20%) - It gives very hard granules. Sir first of all thanks for this initiative, i request you to add rheology and sterilization notes. thank a lot. Excipients plays important role in pharmaceutical formulation. There are many types of pharmaceutical excipients used in formulation like antimicro preservatives, complexing agents, lubricants, solvents, buffering agents etc. Some fast moving excipients are Ethanol, Meglumine, Dimethyl Sulfoxide, Phenoxyethanol, Castor Oil, Benzoyl Peroxide & many more.